On weekend nights in Semarang, one spot that is popular for culinary adventure would be Semawis. It situated in one cut-off street in Pecinan area (Chinatown of Semarang) and many will find this place heaven for Indonesian foods. 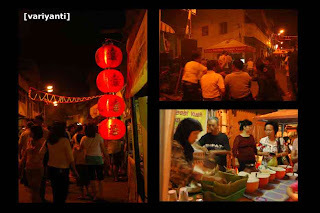 All kinds of specialties are available, foods from seafood, Chinese food, steam boats, bean porridge, satay, meat ball (*bakso), pancake, chicken rice, and drinks from "es puter "Cong Liek" to teh poci "Tegal". This out door space also provides Karaoke stands and warm ambiance from friendly vendors. Some vendors sell clothes, Chinese accessories, even imported Chinese fruits. Note for Muslim visitors, watch carefully for the menus, sometimes there's pork or bacon inside a menu, please carefully ask the vendors before eat. As visitors enter the area, the smell of food may be corrupted with unpleasant smell from the gutter, although this doesn't stop them to enjoy their food. Rises from the sky, little lights and Chinese lanterns, jubilantly coloring the night. Do prepare your selves to be hungry and crave for more delicious delicacies. This is one of a great song we hear there, singing in open air karaokem "The Moon represent my Heart", by Teresa Teng, indeed it's a great song..
get DISCOUNTED PRICE of SEMARANG HOTELS here!